This is a beautiful piece of apple pie-cake. The dough crust has a texture of a cake yet it gives you the satisfaction of eating an apple pie at the same time...haha fantastic piece of pie-cake. 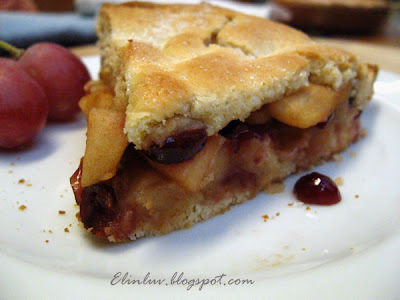 The filling has the tangy-ness from the green apples and refreshing sweetness from the dried cranberries. 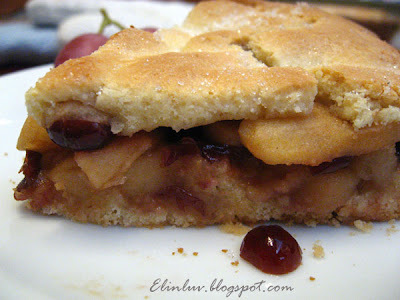 The cinnamon powder infused into the apple slices and cranberries , added flavor to the pie-cake and the aroma that comes out of the oven was most intoxicating to the hungry souls :)) 'Daddy' was the first to come running to the kitchen and asked when he can have that piece of wonderful smelling cake... I told him this... "sorry, you have to wait for that piece of goodness to cool down before you can get to eat it" .....and it was worth his while waiting coz it was yummilicious!!! This recipe is taken from Dorie Greenspan book " Baking From My Home To Yours "
1. 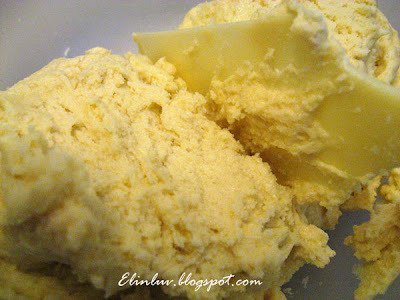 Beat the butter and sugar together in a large bowl on medium speed until smooth, about 2 minutes. Add the egg and continue to beat until the mixture is light and fluffy, about 3 minutes more. Add the baking powder and salt and mix just to combine. Then, add the lime juice. Add the flour a little at a time, mixing to incorporate it and scraping down the bowl as needed. The dough should begin to pull off the sides of the bowl. If it does not, add extra flour, 1 tablespoon at a time. 2. Form dough into a ball and divide it in half. Shape each half into a rectangle and wrap with plastic wrap and chill for at least 2 hours, or for up to 3 days. 3. Peel and core the apples and cut into slices about 1/4 inch thick. Toss the slices in a bowl with a little lime juice. Add the cranberries, sugar and cinnamon; sprinkle over the apples and stir to coat evenly. 5. Remove the dough from the fridge. Press one half of the dough into the bottom of a square baking dish, coated with cooking spray. Pour the apple mixture over the bottom dough. Roll out the second piece of dough and position it over the apples. Tuck any excess into the sides of the pan. 6. Brush the top of the dough lightly with water and sprinkle sugar over the dough. Using a small sharp knife, cut 6 to 8 evenly spaced slits in the dough. 7. Bake for 65 to 80 minutes, or until the dough is a nice golden brown and the juices from the apples are bubbling up through the slits. Transfer the baking pan to a cooling rack and cool to just warm or to room temperature. awww E - "daddy" sounds adorable! but of course, any normal person who looks at that pie will want a piece, too! Love the whole it's-a-cake-no-it's-a-pie deal! I really need to get this book . . .
You bake a lot recently, hor? That cake looks very moist and delicious :). Hope you are having a great weekend! Ooooh.. looks delish! And I so happen to have green apples in my fridge! Can you pls email the recipe? Thk u very much! @ Pearl : Thanks, you are a great encouragement to me too :) Your pean nut butter is now my fav too! @ Little Inbox : Piggy gal is around for another one month before she goes back to college so I have to bake for her breakfast and tea snacks...haha super momsie! It sounds fantastic! Wish I could taste it right now. I love apples and cherries together. Yum! @ s.stockwell: You are welcome:)) I am sure you will love this version. @lisaiscooking: :) Not only sound and look fantastic , it tasted deliriously delicious!!! I'm a regular reader of your blog but not a blogger. Can u share d recipe pls. My email addy is kuennei6@yahoo.com. Thank you. I have sent the recipe to your email addy but I was informed that you email addy is no longer in service. Pls do let me have another addy is you have so that I can send the recipe to you. Thank you for the recipe. I tried baking yday, n its really delicious. 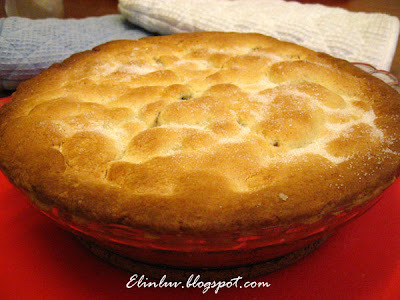 But the set back is that it crumbles once i cut the pie, any remedy for this problem? 1. You have to let the pie cake cool down completely before you cut it. 2. Could it be that you have over baked the pie cake , it will become too dry. And check your oven temperature. hi, can send me at juliana.pesma@gmail.com the recipe. Appreciate lots!